Living in America, there are a few things that we have to deal with. Traffic is one of them. Sometimes traffic is great, you get to sing along to your favorite songs, or listen to an excellent book on tape, and you don't encounter any problems at all. Then there are times when you're getting cut off left and right, where you feel like your car must have a huge target on it because all the idiots in the world are gunning for you, where you're caught at every red light, etc. Those days you might need a bit of help calming down, chilling out, and not having road rage. Aromatherapy helps deal with these negative emotions, and helps keep your car smelling wonderful. Just invest in a car diffuser, add your favorite essential oil blend, and drive carefree. As a bonus, keep a spray bottle in your car, use a great calming blend (include a little Rescue Remedy) and spritz it when you need a little extra help behind the wheel. Here are some of my favorite essential oil blends to use in the car, and a few recipes that might help you get through your drive easier. Remember to store anything made with essential oils in glass, as essential oils have a tendency to eat through plastics. When choosing a carrier oil, I tend to stick to oils such as Olive Oil, Grapeseed Oil, and Coconut Oil. Sweet Almond Oil, Jojoba Oil, Avocado Oil, and argan oil also make great carrier oils. Check out a great list of carrier oils and their uses here. A word of caution. Essential oils are very strong. Avoid using eucalyptus, rosemary, and camphor essential oils around people who have seizures, as well as young children and pets. Mandarin and rosewood are calming and soothing, but only mildly so you don't run the risk of falling asleep. They are particularly effective on any children that may be in the car. Frankincense also helps reduce stress. This is a great blend for families on the go. Grapefruit is uplifting, soothing, clarifying, helps to reduce stress and depression, it's also a lesser-known hangover remedy. Bergamont helps to reduce stress and anxiety, reducing depression and helping to uplift the emotions. Ylang ylang helps to balance our emotions, helping to reduce stress and maintain an air of peace. Spearmint helps to cool our minds and emotions, helping to calm us in times of stress, and provides a protection for our brains, even helping to reduce migraines. All of these oils are stimulating, increasing circulation and uplifting the body as well as the spirit. This blend is a great way to start the day. Ginger and peppermint are well-known helpers when nausea is an issue. However the sharp and fresh smell of citrus can also help to calm a tumultuous tummy. This blend is filled with oils that help calm you down, reduce stress, and let you know that everything is alright. Just take a deep breath and feel the calm working. A calming blend with a more masculine scent. For those guys who don't want their car to smell too “girly” or those ladies who appreciate the more masculine scents in their lives. Nothing can replace a good night's sleep, but this blend can help provide a quick pick-me-up during your drive. Just keep in mind that rosemary and eucalyptus are super strong and should not be used around small children, animals, and people prone to seizures. However, for the rest of us, these oils help energize our minds and help us to focus on our task. Combine all ingredients in a 6 oz glass container with a spray top. Shake well with each use. Spray in the car vents and/or on your person for maximum benefit. Combine in a glass roller ball bottle. Apply to pulse points and/or temples for maximum effect. 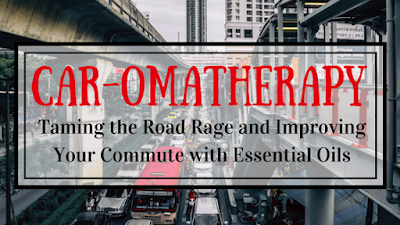 I hope you enjoy these car-omatherapy recipes. For more essential oil blend ideas, check out my previous entry, Herbal Home Fresheners for Spring. If you have any questions or comments, please leave them below!